Trigo-Rodríguez J.M., Lyytinen E., Gritsevich M., Moreno-Ibáñez M., Bottke W.F., Williams I., Lupovka V., Dmitriev V., Kohout T., Grokhovsky V.
We describe the fall of Annama meteorite occurred in the remote Kola Peninsula (Russia) close to Finnish border on 2014 April 19 (local time). 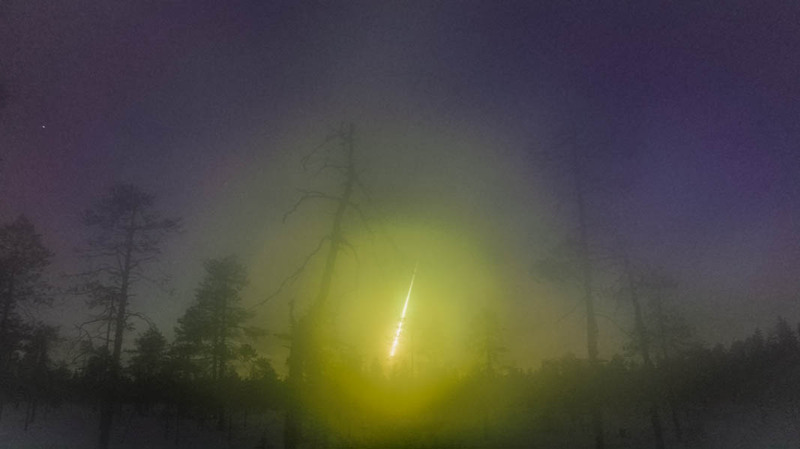 The fireball was instrumentally observed by the Finnish Fireball Network. From these observations the strewnfield was computed and two first meteorites were found only a few hundred metres from the predicted landing site on 2014 May 29 and 30, so that the meteorite (an H5 chondrite) experienced only minimal terrestrial alteration. The accuracy of the observations allowed a precise geocentric radiant to be obtained, and the heliocentric orbit for the progenitor meteoroid to be calculated. Backward integrations of the orbits of selected near-Earth asteroids and the Annama meteoroid showed that they rapidly diverged so that the Annama meteorites are unlikely related to them. The only exception seems to be the recently discovered 2014UR116 that shows a plausible dynamic relationship. Instead, analysis of the heliocentric orbit of the meteoroid suggests that the delivery of Annama onto an Earth-crossing Apollo-type orbit occurred via the 3:1 mean motion resonance with Jupiter or the nu6 secular resonance, dynamic mechanisms that are responsible for delivering to Earth most meteorites studied so far.